Yesterday, the British Safety Council, one of the most trusted international leaders in health, safety and environmental management, launched the India Safety Leadership Group, a forum for its members in India to share best practice and expertise in health, safety and wellbeing and lead broader change across all sectors. For over 60 years, the British Safety Council has been campaigning to protect workers and improve workplace conditions and practices, both in Britain and worldwide. In India, where around 80% of the estimated 465 million-strong workforce are not protected by the existing health and safety legal framework, the British Safety Council aims to raise awareness of the importance of managing health and safety risks in the workplace. It will also challenge traditional views and approaches, as well as supporting employers in adopting practices which better safeguard the health and safety of their workers. The British Safety Council has been supporting the Indian market for over 30 years, providing health, safety and environmental consultancy services, training and audits from its UK office in London. In November 2017, the organisation opened an office in Mumbai to offer a greater range of products (audit, training, e-learning, qualifications and membership) tailored to the needs of the Indian market. The office is also a base from which the British Safety Council will start campaigning and progressing its charitable work in India. 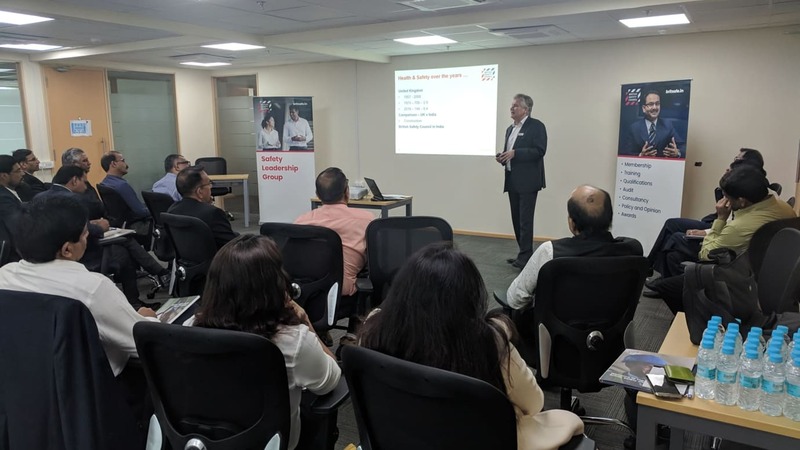 Opening the first meeting of the India Safety Leadership Group, Mike Robinson, Chief Executive of the British Safety Council, said: “India is one of the world’s fastest growing economies, making great progress in all areas, including health and safety. Yet, there is still much to be done. Overall, workplace deaths in India are 20 times higher than in the UK: it is estimated that there are 48,000 work-related deaths in India each year, while there were 144 workplace fatalities in Britain in 2017. “The British Safety Council aims to bring about a culture change with regard to workplace health, safety and wellbeing. Although legislation is very important in helping to bring about this change, factors such as leadership are essential for introducing and embedding it. We should also start preparing for the changes to the global labour market. The World Bank predicts that 69 per cent of jobs in India will be threatened by automation or artificial intelligence over the next 20 years. Moreover, the population in India aged over 65 will double over next 30 years. Working together through the platforms like the India Safety Leadership Group, we can start to prepare for the times ahead. The British Safety Council already works with over 100 companies in India, many of whom are on the India Fortune 500 list. Among its members are: Indian Oil, Larsen & Toubro, Mumbai International Airport, Reliance Industries and Tata. Many leading Indian businesses take part in the British Safety Council’s International Safety Awards and the Sword/Globe of Honour awards and send delegates to the British Safety Council’s training courses in London. The British Safety Council is dedicated to making sure no-one is injured or made ill at work. Our role is to help you achieve the very highest Health and Safety standards required by law, to protect your bottom line and your staff alike. We achieve this by teaching the right courses to the people who need them. We learn from our global network of health and safety professionals. We ceaselessly campaign and influence in the cause of better Health and Safety, never in the cause of financial profit.